Pre-seed funding is becoming increasingly popular for entrepreneurs as investors’ expectations for emerging companies continue to rise. While all means of raising capital for your business ventures can be viable, this particular one requires a specific type of preparation to set yourself and your business up for success. Adhering to the following standards can make your startup more attractive to pre-seed investors. The pre-seed round is set apart for many reasons, one of the most prominent being that most pre-seed stage companies are not yet profitable. This can make some investors, those who don’t specialize in one specific round, nervous. Put investors at ease by clearly outlining your business’ path to profitability. A thoughtful plan that serves as a long-term roadmap can be more important than a shortcut. Keep your estimates attainable and concise. Don’t force investors to go hunting for the profitability statements, either. Emphasize strategy and transparency in this tactic. To win investors you need to build trust and credibility. Including this information in an executive summary and expanding upon it in financial statements is essential to achieving both trust and credibility. Similar to path to profitability, proof of concept is key in winning over investors. Whatever your business has done to test your ideas, assumptions or products needs to be communicated clearly and transparently to your potential investors. Consider bringing in actual test models or results and sharing your expanded takeaways. If your original tests led you to make changes, communicate these updates with investors. Demonstrating that your business can pivot toward a more successful offering will show investors your ingenuity and flexibility within the grand scheme of your business plan. A caution here, proof of concept and prototypes are very different. If your business is building a product you don’t need to necessarily bring in that product, but rather find a way to demonstrate to potential investors why this product is needed in the market – what holes does it fill for users? Your proof of concept should demonstrate that your company can achieve its end goal. In the absence of cash-on-hand or hard assets, patents and other intellectual property protections can go a long way to building credibility with investors. Demonstrating that you take your ideas seriously and work to protect them from infringement by other business entities tells investors that you are committed to your idea and willing to go through legal loopholes to protect it. Even if your patent application is pending and won’t be resolved for years, that’s still solidifies your company’s credibility and make the opportunity more investable. Mainly, a patent lets investors know they are protected against future competitors. Even with the proper legal preparation, opportunists will still attempt to challenge it. 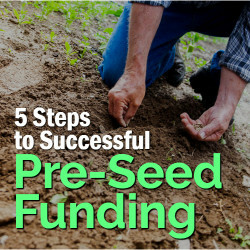 Don’t be alarmed if you must lawyer up during a pre-seed stage. It means your idea is a good one! Plus, if your patent is challenged and you win, that IP becomes much more valuable. Your previous success can also be an asset. Look back into your professional accomplishments and use them to your advantage. If this isn’t your first startup or first time sourcing funding of any sort, bring a list of your past ventures and their successes. Even if this is your first foray into the startup world, your professional accomplishments can still be relevant. What projects have you successfully shepherded into reality? Are you a consumer looking to fill a hole that you yourself have been subjected to? Use that real-life experience. Just be sure to explain how you were successful and back it up with quantifiable and provable evidence. The point of this step is to show investors why investing in you, the entrepreneur, will make them money. Your idea may grab investors’ attention right off the bat. Now, prove to them that you are the right person to bring that idea into reality. Conversely, investors may not be excited by your idea so make them excited about you. Chances are you are not going it alone at this point in your journey, and that is a good thing. Whether it’s an advisory board of industry experts, a crack legal team that has helped you refine your intellectual property or a business partner with expertise that you don’t have, these are all things to brag about while seeking pre-seed funding. You have the skills necessary to build a team of strategic partners that will get your business off the ground. Investors are a part of that strategic team, so introduce them to their future partners. Additionally, if you are in the process of building strategic partnerships, share some of the information with potential investors to let them know you are focused on this important step in your path to profitability. They might even be able to connect you with the right people. Pitching to investors is always going to be an important element in your startup’s journey to success. Make it easier by being prepared and knowing what areas to highlight. An experienced CPA can prove to be invaluable resource in this process, especially in the early stages where there isn’t much that an entrepreneur can point to. Just because you don’t have a complex balance sheet to show off yet, does not mean you can’t create an outline for one. Bradford Hall, CPA and Managing Director at Hall & Company has over 37 years of experience in providing tax and accounting services to businesses and individuals both nationally and internationally from startups to multinational corporations. He is a graduate of the University of Southern California where he earned a Bachelor of Science degree in Accounting in 1978 and Master Master’s Degree in Taxation from Golden Gate University in 1986.